Use Excel's Get & Transform (Power Query) experience to connect to an Oracle database. 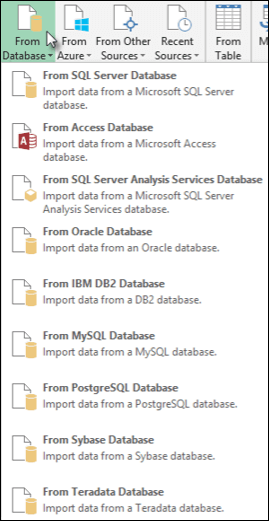 Note: Before you can connect to an Oracle database using Power Query, you need the Oracle client software v8.1.7 or greater on your computer. To install the Oracle client software, go to 32-bit Oracle Data Access Components (ODAC) with Oracle Developer Tools for Visual Studio (12.1.0.2.4) to install the 32-bit Oracle client, or to 64-bit ODAC 12c Release 4 (12.1.0.2.4) Xcopy for Windows x64 to install the 64-bit Oracle client. Click on the Data tab, then Get Data > From Database > From Oracle Database. If you don't see the Get Data button, then click New Query > From Database > From Oracle Database. In the Power Query ribbon tab, click From Database > From Oracle Database. In the Oracle Database dialog box, in Server Name specify the Oracle Server to connect to. If a SID is required, this can be specified in the form of “ServerName/SID”.